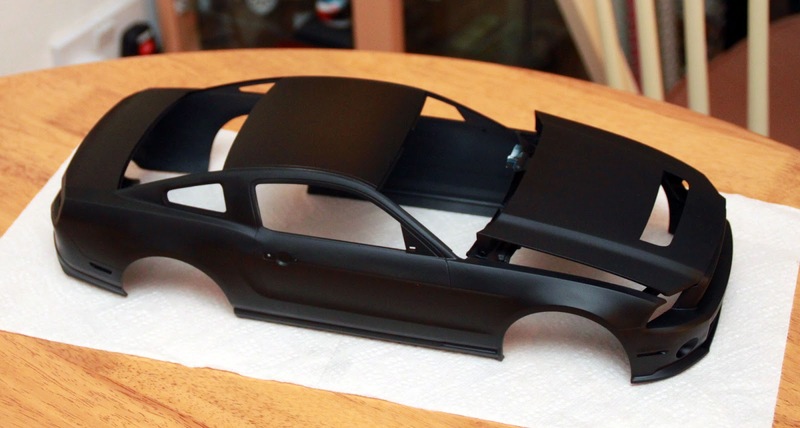 I have been messing around trying to decide what colour to paint the body shell of the Mustang. Remember that this is going to be VERY shiny. I tried a mid blue but couldn't get that to be consistent across the body - I am doing all of this on the bonnet so that I can quickly clean anything off and not harm the overall shell. I wiped that off and went for a LifeColor matt blue but again, problems with shading across the area. I then hit on using Xtracrylix Gloss Dark Sea Blue - that went on really well but I only have 1/2 a bottle and that won't do the whole car - and as Hannants won't send paint on its own........ Valerie suggested that I think of a black body shell.Now that was a blinder because I am in love with Vallejo Black Polyurethane Primer - it goes on well, sprays directly out of the bottle, sticks like the proverbial, dries quickly, has a very even finish and can be touched up without showing any edges. Here is the result. This should look fantastic when it has a few coats of Johnsons Klear on it. Any stripes in the plan? Two nice big white stripes right down the middle, of course!